"The noise and the smells... It was horrible." A photo one passenger posted from the Norwegian Sun cruise ship on a Facebook passengers group. UPDATE: In an updated statement, Norwegian Cruise Line has now offered the passengers full credit of the fare they paid, saying they can use it towards any cruise until March 31, 2023. "We realize that this gesture cannot replace their recent experience but do hope to have the opportunity to welcome them on board again soon," the company said. Cruise ship passengers, including Canadians, are aggravated by what they say was incessant construction on a two-week-long Norwegian Cruise Line voyage last month. Ottawan Charles O'Dale said he and his girlfriend Gillian were only notified of the work after the ship was at sea — and after they heard a jackhammer on the deck above them. "We were sitting on the balcony enjoying life, and then the jackhammer one metre from my head started going," he told HuffPost Canada. He said his ears were ringing for a day afterward and their cabin balcony railing was covered in metal shards. 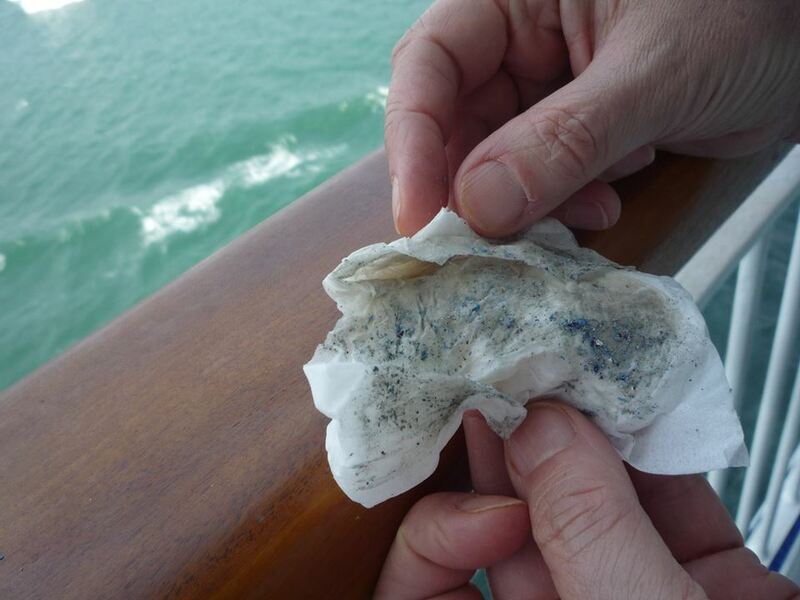 They and many other passengers on the Norwegian Sun, which sailed from Miami to Los Angeles, are angry at the cruise line for not only disrupting their vacation with noise, chemical smells and frequent messes from the work, but putting their health and safety at risk. The metal shards that Norwegian Sun passenger Charles O'Dale said rained down on his and his girlfriend's balcony from construction a deck above. O'Dale said he's a navy veteran and has done construction and repairs on board a ship. He said that none of the passengers, many whom were eating food on the same deck as a construction site, had any sort of eye, mouth or ear protection. 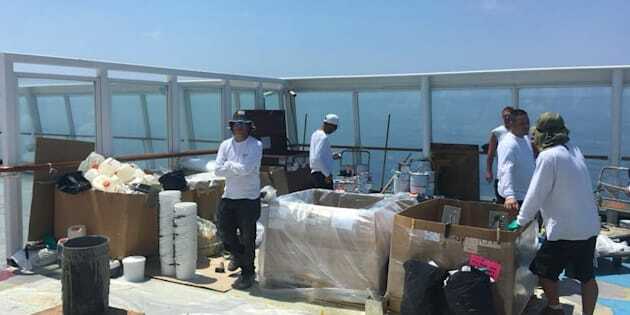 Passengers have joined a Facebook group where they've shared their stories and photos, as well as efforts to reach out to the cruise line and to Bolidt, the company whose decking products were spotted on the vessel. Travel Horror Stories: What's The Worst Experience You've Had While Abroad? "Flammable liquid and vapour," read thewarnings on a barrel of a Bolidt primer. "May be harmful if inhaled." One passenger wrote on Facebook that she has a persistent cough after the trip and another said metal shards ended up in her son's eyes. Others remarked on big chunks of soot all over a deck and fine white powder on the surfaces in their cabin. "There was so much dust, it was in my eyes, my mouth, my drink. The noise and the smells... It was horrible," wrote one passenger. "I love the open air BBQ with the taste of paint/deck material," wrote another. O'Dale said he filed an official complaint with the front desk during the sailing, but received little more than a polite "sorry." "During the complaint, I specifically said that my health and safety was compromised with the construction, and the only thing that they said in their apology was 'sorry for the inconvenience,'" he says. But he doesn't blame the crew, saying that they tried to make the trip as pleasant as possible. "The desk guy didn't know anything about it," he said. "The only thing he said is that it's above my head." Norwegian Cruise Line said in a statement to HuffPost Canada that the upgrades are part of a program called Norwegian Edge, "designed to ensure every ship across the fleet delivers a consistently high-quality experience to all of our guests. " "While we do our utmost to minimize any impact on the guest experience when these enhancements are taking place, we recognize that in this situation our guests have experienced some inconvenience," it said. "As a gesture of our gratitude for our guests' patience and understanding, we will be extending a future cruise credit of 25 per cent of their cruise fare paid, which can be applied towards another cruise of their choice from now through March 31, 2019." CTV News reported that the boat is set to arrive in Victoria this week, where the work on it will continue in dry dock. O'Dale said he was offered the discount, but isn't eager to travel on Norwegian Cruise Line again, calling the cruise a ripoff. He said that if someone launches a class-action lawsuit, he'll happily join it. "If they had told us [about the construction] before, I would have cancelled the trip," he said. "But you're on the ship, it's sailed, then these things start. There's nowhere to go."